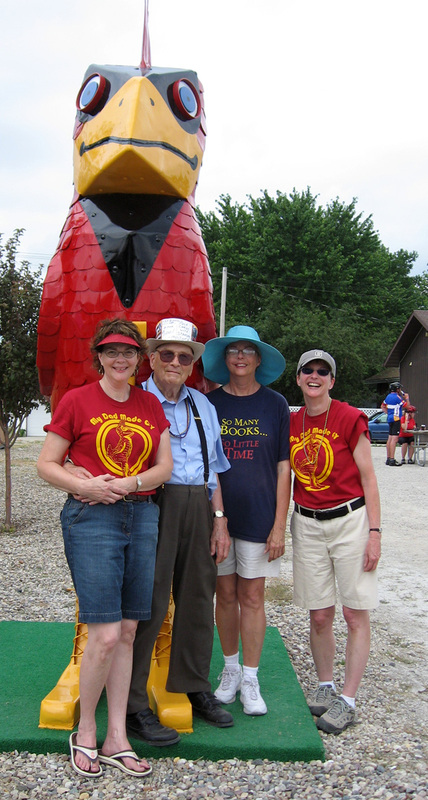 When RAGBRAI went through Rolfe on July 23, 2007, most of our family spent the day in town and enjoyed the many bicyclers and onlookers who talked with our father and visited his Cy sculpture on Garfield Street. 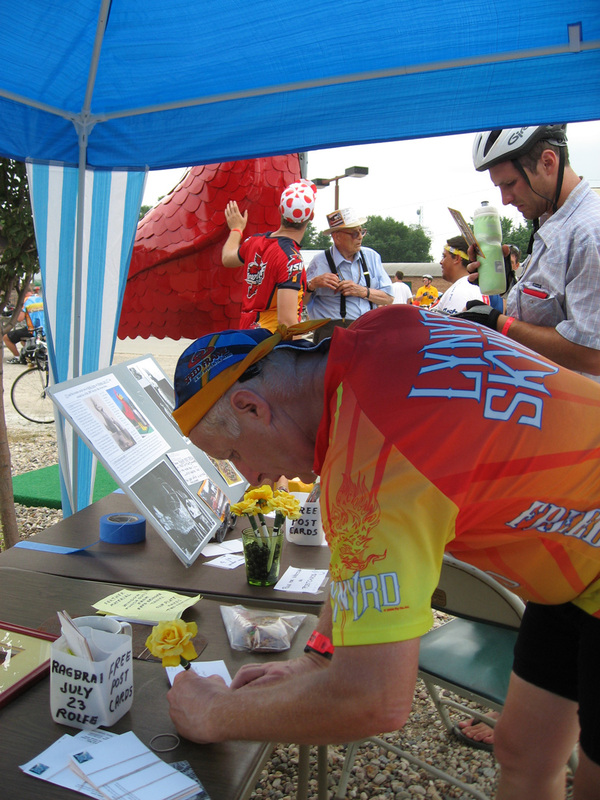 In fact, my husband Hal and I had just concluded our Okoboji vacation in time to be in Rolfe for RAGBRAI. While I was visiting with people near my father’s tent, a woman approached me and said, “You walk through our neighborhood everyday.” I did not know who she was or what she meant, especially since I lived in Omaha and didn’t recall seeing her there. She immediately explained she lived in the Maywood area of West Okoboji and recognized me from my daily walks through that neighborhood where our family has a cottage. What she really recognized was the wide-brimmed, blue hat I wear when I’m walking in bright sunshine. Betty and Bob Lee live in a small cluster of very nice, new homes at the north end of Maywood. I’d noticed their license plates, BNBLEE, but had not yet met Betty and Bob. We visited for a while, and they introduced me to another couple, Bill and Judy Carmichael, who live next door to Betty and Bob. Bill grew up in Pocahontas where his father, Bert Carmichael, had been an attorney. Bill said he and Judy had one of Mother’s paintings that had originally belonged to Bert and Madora Carmichael. Bill and Judy said I could see the painting when I was at Okoboji the next summer. In the fall they sent me a photograph of it. 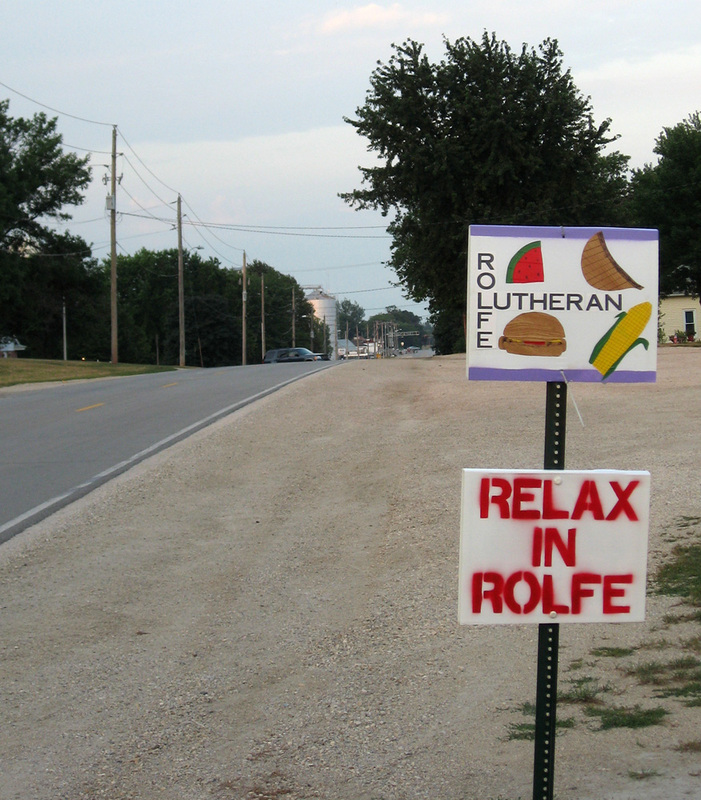 This entry was posted on July 8, 2009 at 11:52 pm and is filed under Deane Gunderson, Ear of Iowa Corn, Iowa, Marion Gunderson, Rolfe, Watercolor, Watercolor image. You can follow any responses to this entry through the RSS 2.0 feed. You can skip to the end and leave a response. Pinging is currently not allowed. Just one thought on improving: I didn’t realize till I got to “my husband Hal” that Clara was the writer. I didn’t notice the “By cghoover” at the top–kind of small, plus I was eager to get to the rest. And I assumed the “Submitted by Clara Gunderson Hoover” was referring to the photo. So, maybe some way to make it more noticeable and clear?